The Hemodialysis Unit provides the most optimum care specially targeted towards patients with acute and end-stage renal failure. It employs a multidisciplinary approach for the holistic management and treatment of kidney diseases. 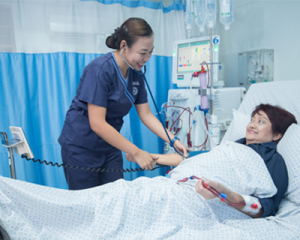 Equipped with advanced renal care technologies under the supervision of board-certified nephrologists and highly trained nurses, the Unit consists of 15 stations located in two different floors. Separate units are designed for dialysis patients in the Intensive Care Unit.